This recipe for hearty Vietnamese-style chicken curry and vegetables using a slow cooker will become one of your favorites because of the simplicity. Prep everything the night before and refrigerate. Prior to leaving for work, put everything in the slow cooker and let it works its magic. When you get home, thicken the curry. During the last 30 minutes, make a salad, set the table and dinner is served. Love it! – This recipe uses much less coconut milk than traditional recipes–so it’s not as rich but much healthier. If you don’t like coconut milk, substitute 2% milk or half-and-half. – If you’re not a huge fan of eating lemongrass but enjoy its essence, omit the minced lemongrass in the marinade and substitute a bruised lemongrass stalk (as done for the curry). This incorporates the lovely aroma of lemongrass without having to eat it. – Yukon gold potatoes or red potatoes hold up best in this recipe because of their firmness. Even after 8+ hours cooking, you still have distinct potato chucks while the Russets break down. – The thickening with the cornstarch at the end is optional. Some people enjoy a more soupy version. 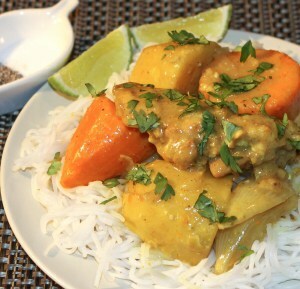 – I use a mild yellow curry and add diced red chillies to the servings for the heat-seekers. – Slow cooker meals are very forgiving. You can continue to cook for awhile longer and it will still be delicious! Combine chicken, shallots and lemongrass in a large re-sealable plastic bag. Add curry powder, garlic, ginger, and fish sauce. Remove some of the air from the bag and then seal it. Using your hands, work marinade into chicken, coating it evenly. Marinate in refrigerator for at least one hour. Cut off end of lemongrass and discard. Cut off a 2-inch section of stalk. Remove dry outer layers and discard. Using a wooden pestle or meat hammer, bruise the lemongrass. Peel potatoes and yams. Cut into large chunks approximately the same size. Peel onion and quarter. Add broth, coconut milk, curry powder and bay leaves into slow cooker. Whisk until the curry powder is dissolved. Add lemongrass, potatoes and yams. Use tongs to evenly distribute vegetables along the bottom, filling in all gaps. Layer chicken on top of vegetables. Add onions on top of the chicken. Arrange so there is an even layer and all pieces are touching broth. Set slow cooker to Low. Cover and allow to cook for at least 8 hours. Gently remove chicken and vegetables and place in a large bowl. In a small bowl, combine cornstarch and water and stir until smooth. Pour mixture into curry and stir well. Add chicken and vegetables back to slow cooker. Cover and turn up heat to High. Cook for another 30 minutes. Discard the lemongrass stalk and bay leaves before serving. Serve piping hot over rice noodles or with crusty French bread. Lovely video! Would if be possible to use frozen lemongrass opposed to the stalk ones? Frozen lemongrass works great. Enjoy! Is this possible in the instant pot? How long would I cook it for and are there any changes that would be needed? Thank you! The Instant Pot has a slow cook feature so you could make this recipe without any changes. Good Luck!